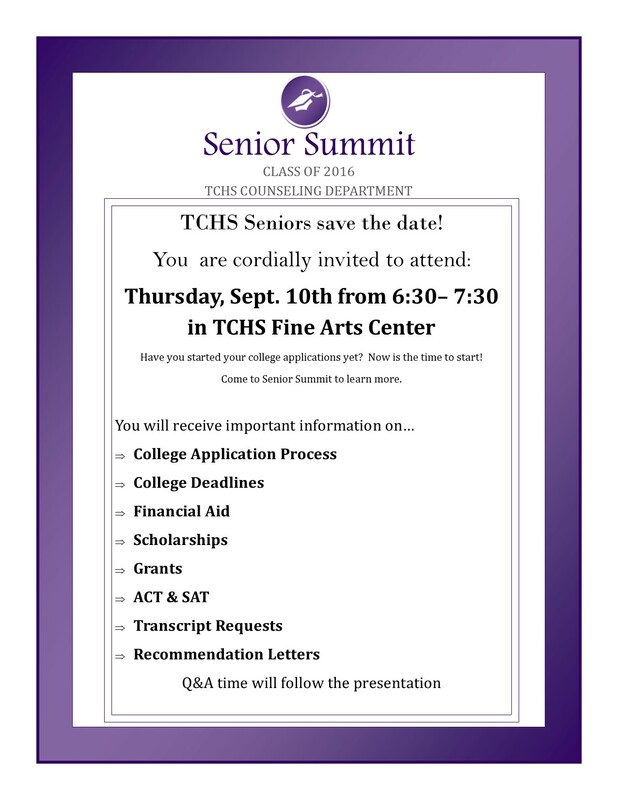 Timber Creek Seniors are encouraged to attend the Senior Summit on Sept. 10 from 6:30 to 7:30 p.m. in the TCHS Fine Arts Center. Class of 2016 Seniors should go for important information and/or questions involving ACT & SAT, the college application process and college deadlines. Counselors will also cover information about grants, transcript requests, financial aid, scholarships and recommendation letters. Questions involving the topics covered at Senior Summit can be asked after the presentations. Avery Vaughn is a student reporter for the Timber Creek Talon. She joined the Talon because of her newly found love of journalistic writing.